Vavoom's bright orange juice tones might make your eyes pucker…but its sweet treat of glowing colour lasts to the very end of every long-lived blossom. Put that gleaming orange against deep mahogany red new growth and glossy green leaves and you might just need to grab your sunglasses! Floribundas are a relatively new group of roses. Introduced in 1930, the original floribundas were the result of crosses of large-flowered Hybrid Tea roses and an old-fashioned class of dwarf roses called Polyanthas. 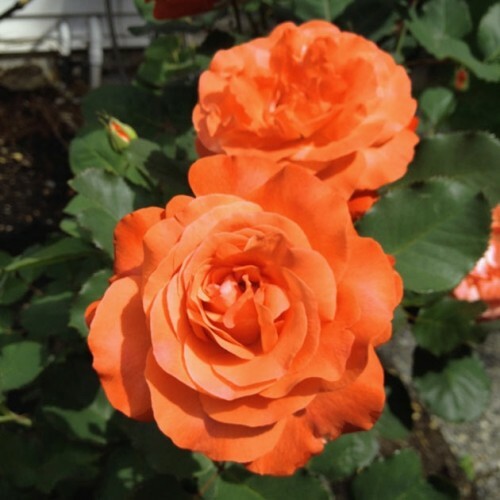 The result has been relatively compact bushes with superior hardiness and disease resistance that produce large clusters of somewhat smaller blooms. 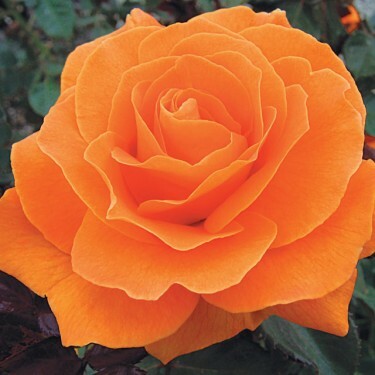 Generally speaking, Floribunda roses are bushy shrubs that produce flower clusters of 3 to 15. They are everblooming and have the same wide colour range as do the Hybrid Teas. They are especially valuable for their ability to adapt to a wide range of temperature and soil conditions. Today they are still used in large bedding schemes in public parks and similar spaces.